Fisheye cameras have been around for years, but real-life adoption seems to be limited, due to a limited number of offerings and VMS integrations. Things are changing for the better, as more camera manufacturers and management software providers pay more attention to the optics and user benefits. a&s looks into the latest developments. Panoramic and hemispheric lenses have been used by photographers for decades. Nowadays, one can literally shoot images with panoramic or fisheye effects with smartphones. Still, what is common in the consumer electronics industry may be exotic in security. One way to envision a 180-degree view is to imagine standing in the center of an alley with your back against a wall. “Cameras mounted where your head is would be able to see the whole alley including both ends and the wall that your head is against,” said Ellen Cargill, Director of Product Development for Scallop Imaging (a division of Tenebraex). Some trade-offs still exist for fisheye cameras. As a fisheye camera uses a specialized lens that distorts the image of a scene to fit it into a single view, circular fisheye images do not use all the pixels on an image sensor. Also, image magnification diminishes as the subject moves toward the edges of the scene despite that megapixel image sensors and digital image processing have improved fisheye performance on the edges of the field of view. Fisheye lenses project a circular footprint and have constant or linear distortion from the center to the edge. Objects closer to the camera appear bigger, while they reduce rapidly in size as the distance from the camera increases. In other words, users could have an unavoidable drop-off in image quality at the edges. These issues might be “magnified” after dewarping. It is similar to the difference between a globe and a map of the world when attempting to provide a two-dimensional representation of the three-dimensional world. Both poles are squished, like oversized representations of Antarctica and Greenland on some maps. The same goes for a fisheye lens: the farther an object is from the center of an image, the more distorted it becomes. Image distortions and pixel drops of fisheye cameras are hard to read from technical specs. The best way is to actually test the cameras and check the details. “When comparing, make sure that you compare ‘apples to apples' — that is, the same part of the scene, the same field of view, same distance and direction angle from the camera,” Bennermark said. There is a lot of confusion when it comes to representing the true resolution of fisheye cameras as they, compared to fixed cameras, have a smaller optical image sensor. Greg Alcorn, Director of Global Sales at Oncam Grandeye shared some simple mathematics that can help end users and integrators check exactly what resolution they are getting. “Most manufactures use a 5-megapixel sensor, or 2592 by 1944 pixels, and the image is then cropped to the size of the lens, or a circle within a rectangle. The circle, therefore, has a diameter of 1944 pixels and the following equation is used to calculate the true resolution. The actual resolution equals the area of the circle. [In this case, the actual resolution is 972x972, which is 2.9 megapixels.]" Dewarping on the client side, on the other hand, allows for retrospective viewing, which enables the user to go back in time to view the total scene in its original form and then pan, tilt, and/or zoom within the 360-degree image as desired. “An additional advantage to dewarp on the client side is the ability for multiple clients to view the same image with different perspectives concurrently. There is no time slicing required as with traditional PTZ cameras or 360 cameras with dewarping onboard the camera,” Alcorn added. Most fisheye manufacturers require a separate SDK for dewarping and e-PTZ controls. This makes integration to V MS systems challenging. In order to enhance the algorithm to the fullest of fisheye cameras, a VMS with full support is crucial. Limited VMS integration will block immersive fisheye cameras from being used effectively. VMS which support multiple manufacturers or even an established standard are key for broader adoption of fisheye cameras. 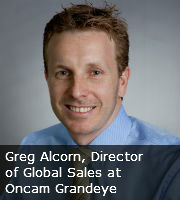 Oncam Grandeye is optimistic about the potential of fisheye cameras and increased integration with VMS platforms. “Technology moves forward and image quality gets better. VMS, like everything else, is advancing. We have developed an SDK for multiple platforms that can be integrated into any clientside application. It comes with our patented dewarping technology using OpenGL and 3D modeling techniques to project a texture map of the image onto p-surface (a 3D object, generated by a computer graphic system). This takes advantage of current state-of-theart GPUs (graphic processor units), which reduces the load on the CPU. Performing dewarping on the CPU could use as much as 20 percent of the CPU's performance, based on the size of the image and frame rate,” Alcorn said. Brickcom is also eager to increase its technology partners. “Our fisheye camera is compatible now with more than 40 VMS solutions thanks to the open ImmerVision 360-degree viewing standard,” Fang added. If cameras are capable of dewarping, VMS interoperability is not a concern. “As Axis does dewarping in the camera, VMS is subscribed to the already dewarped images. These dewarped images can be dynamically controlled to make it a digital PTZ camera. There is no need for VMS applications to deal with dewarping,” according to Bennermark. Some manufacturers are launching day-night fisheye cameras for 24-hour coverage. Also, they can be deployed outdoors. The goal is to allow fisheye cameras not to be limited to indoor installations but to wider outdoor areas.